In the Sea King’s most competitive dual meet this season, Northwood dominated the league meet, sweeping victories in the Varsity, JV and Frosh/Soph match ups. Despite a strong showing from both relay races and many top 3 finishes, the CDM Varsity Sea Queens fell short by 1 point in team scoring. All the more reason to keep working hard this season to improve our individual and team times before league prelims! The CDM v. Woodbridge HS meet remains (April 25) before going into league prelims and finals. 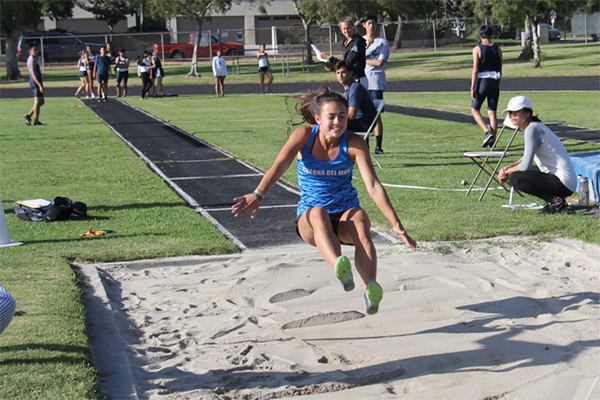 CDM had 22 of our Track & Field athletes entered in this week’s OC Track & Field Championships, with a number of top 10 finishes. This prestigious event has a 40+ year history, and Orange Country’s best athletes from all divisions and school sizes, many ranked nationally, compete. Special congratulations to Morgan Simon, Varsity Women’s Pole Vault, for her 2nd place finish, Shannon Strassman, F/S Pole Vault, for her 4th place finish, and Paige Damron, Varsity Women’s 300m Hurdles, for her 5th place finish, as well as those who achieved Personal Records (PR’s)!